Barye sculpted many small bronzes of dogs early in his career, most were hunting dogs, Spaniels, Setters, and Pointers. These were popular and many variations were produced, showing these hunting dogs pointing birds and rabbits and as single sculptures on a simple base. 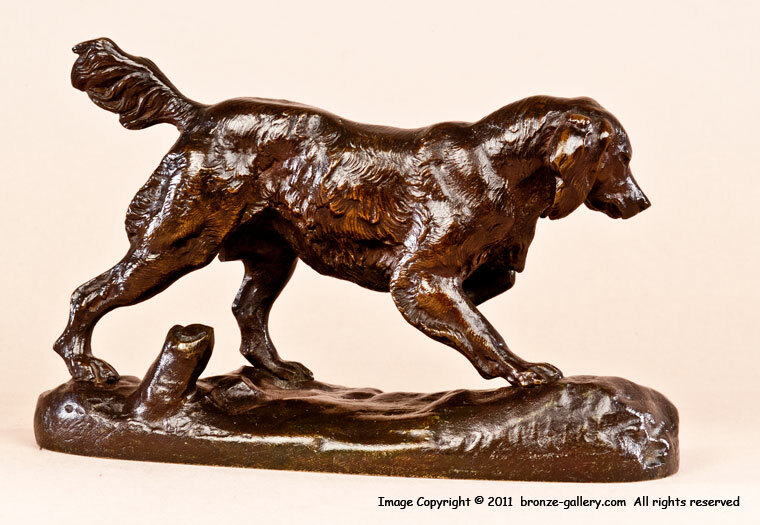 This fine small bronze is the First Version of Barye's Epagneul, it is the original model done with the dog on point on a simple base with a small tree stump. The dog is frozen on point and Barye has captured the intensity of this hunting dog perfectly. The bronze is a very fine cast with sharp details in the fur and texture. 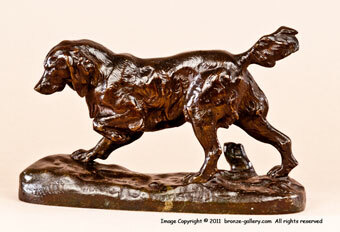 A wonderful example of Barye's best work.